FREE EVENT FOR PARENTS, CAREGIVERS AND CHILDREN. 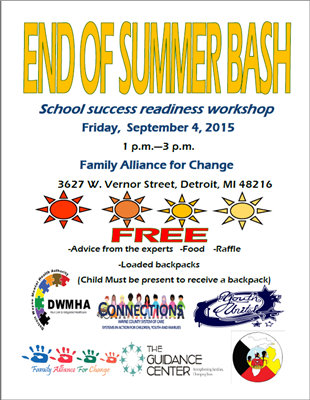 The End of Summer Bash: School Success Readiness Workshop is tomorrow, Friday, September 4th, 2015 @ 1:00pm-3:00pm. At this free event, there will be advice from experts, food, raffle, music, kids activities, and giveaways (child must be present to receive a backpack). My apologies for lateness of information, I just learned about this one! EVENT LOCATED AT: Family Alliance for Change, 3627 W. Vernor St., Detroit, MI 48216. Please spread the work widely!! This event is made possible through collaboration between Detroit Wayne Mental Health Authority, Connections Wayne County System of Care, Youth United, Family Alliance for Change, The Guidance Center, and American Indian Health and Family Services.